Well-known as the gateway to South Africa, Cape Town with our warm African sunshine and abundance of friendly faces is an extraordinary city that offers a huge variety of jaw-dropping wedding venues to get married in. Not only that, but it provides a beautiful place for your wedding guests to visit with really good weather. You’ll also find an abundance of superior quality wedding services from legal assistance & religious services through to (much more affordable than Europe) dress makers, wedding photographers, caterers, accessories and of course, wedding coordinators! Cape Town is truly one of THE top wedding destinations of the world for good reason and here are SIX reasons why it is set apart from any others. 1.Weather – Firstly (and most importantly) in planning a wedding venue is the consideration of weather. Because weddings need to be planned so far in advance the weather is one of the most important factors to consider. Whilst we put everything in place for a rainy day, the ideal is to at least have a sunny day, that’s not too hot and not too cold. Cape Town has a beautiful temperate climate all year round. February is the hottest month in Cape Town with an average temperature of 23°C (73°F) and the coldest is June at 13°C (55°F) with the most daily sunshine hours at 11.05 in December. The only months we would try to avoid are the wetter month of July and the windier month of December at which point we would recommend re-routing your wedding plans to The Garden Route with an average of 100mm of rain. (Source: Holiday Weather). Our Springs are soft and silky. Autumn tingles like champagne on the skin. Winter is crisp as an apple and our African summer bronzes the soul with its pure sunlight but is generally not too hot. Whatever the season, Cape Town stays green; perfect for wedding photography and the mild winters ensure sunny mostly wind-still days referred to as the “secret season”. 2. Affordability of service providers – At the time of writing, the exchange rate is currently R18 to the Pound Sterling and R14 to the US$ and Cape Town has an abundance of phenomenally good, top class wedding service providers and suppliers such as award winning wedding coordinators and photographers, chefs, stationery designers, cake & dress makers, wedding outfitters, extremely good & affordable wine producers and other service providers that charge a fraction of the cost of a comparable wedding supplier or wedding planner in the UK meaning you will now be even more popular with your new father-in-law AND you will have more money to spend on your honeymoon with endless opportunities and short flights from Cape Town to places like Mauritius, Zanzibar, Seychelles, Madagascar, Kenya, Mozambique etc. 3. Accessibility – Cape Town is so easy to get to from everywhere. There are direct flights to Cape Town with Emirates, KLM, Singapore Airlines, Virgin Atlantic, Lufthansa, Edelweiss, British Airways, Air France and more. 4. A holiday destination – Cape Town is firstly one of the world’s most beautiful cities in the world and was recently voted the Number One Travel Destination on Trip Advisor’s Travelers Choice Awards. It also boasts the famous Table Mountain recently awarded the winning contestant of the “New” Seven Wonders of the World in…… Cape Town is home to one of the most romantic & scenic drives in the world. The South Peninsula; Chapmans Peak Drive is dotted with picture perfect sunset spots and backdrops of sheer mountain ridges and spectacular coastline. So many couples have popped the question at Cape Point, Table Mountain, Kirstenbosch that there is romance oozing from every corner of Cape Town. 5. Wine – South Africa is the 7th biggest wine producing country in the world and surrounding Cape Town are no less than about 120 wine producing estates within 2 hours drive of Cape Town with MANY excellent wines and bubbly under R100 /R120 per bottle. The Venue at MolenVliet overlooks the beautiful Vineyards and the Stellenbosch Mountains; it is conveniently situated next to the Dwarsrivier River, which flows throughout the Estate. Once the Reception is in full swing, the Main barrel doors opens up and your guests are greeted with the shimmering lights of all the custom chandeliers. This venue enables you to confidently entrust your special occasion in our capable hands and rely on us for ultimate service delivery, we are known for, our excellent service and attention to detail throughout the local and International Industry and will make sure that only the best service providers are selected to make your special day an unforgettable one. Definitely one of my favourite venues… Consistently voted as one of South Africa’s top Wedding destinations, Cavalli Estate is a dream setting for any special event. Cavalli Estate is quickly becoming recognised for its exquisite views within its modern and luxurious context, Located conveniently on the R44 highway nestled below the majestic Helderberg mountains. Whether planning a wedding or corporate event, Cavalli Estate has been designed to be flexible enough to tailor itself to events of any scale or nature. Boschendal provides an idyllic natural setting for large and small weddings and functions. 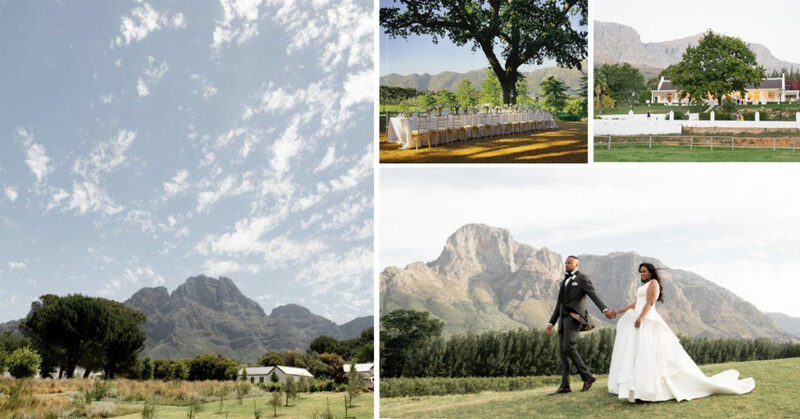 Surrounded by the breathtaking Groot Drakenstein and Simonsberg mountains you will find many function venues to choose from enabling you to tailor your special event. Boschendal is located in the centre of Franschhoek, Paarl and Stellenbosch. Up to 150 guests can be accommodated across the farm in luxury self-catering cottages. All the functions are catered in-house. A big plus point; Boschendal raise their own award-winning Black Angus cattle, acorn-fed pigs, free-range chickens and harvest most of their vegetables from the organic Werf Food Garden. Weddings by Marius have been planning weddings since 1995. With over 20 years of experience and a reputation for being able to produce the most magical of weddings with seamless perfection under the careful eye of Marius, you can rest assured that every element will be completely taken care of to deliver the very best wedding you could ever dream of.